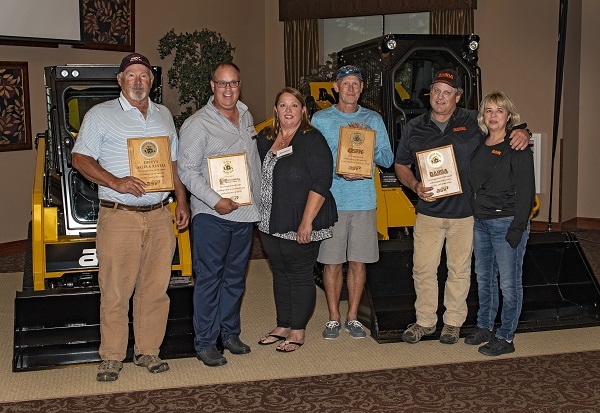 ASV Holdings Inc., an industry-leading manufacturer of all-purpose and all-season compact track loaders and skid steers, recently announced its 2018 dealer award winners. The awards honored top-performing and loyal members of its growing list of dealers at the company’s annual dealer meeting. ASV named Ontario-based Regional Tractor Sales as the 2018 Dealer of the Year due to the company’s exceptional sales, performance and loyalty. The family-owned dealer took on the ASV line in 2005 and has worked closely with the manufacturer ever since. ASV also presented CSTK of Kansas and Missouri with the Rookie of the Year award. The new dealer has gone beyond expectations in its market, developing a market strategy, driving sales and brand name awareness. ASV also presented awards for 20-year dealers. Recipients included Alberta-based Barda Equipment and Wisconsin-based Duffy’s Sales & Rental.